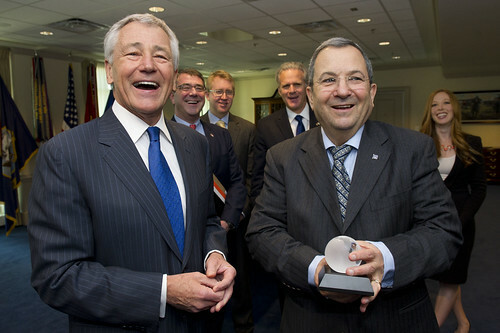 Secretary Hagel hosted Israeli Minister of Defense Ehud Barak yesterday at the Pentagon for his first meeting with a foreign counterpart since taking office as secretary of defense. Secretary Hagel expressed his strong commitment to Israel’s security, including maintaining Israel’s qualitative military edge and continued U.S. support for missile and rocket defense systems in spite of fiscal constraints. Secretary Hagel and Minister Barak agreed that the United States-Israeli defense relationship has never been stronger than during the Obama administration and that both nations will continue this unprecedented close cooperation. The leaders discussed the range of security interests shared by the U.S. and Israel, including the need for the Syrian regime to maintain control over chemical and biological weapons in their country; the leaders pledged to continue U.S.-Israel contingency planning to counter that potential threat. Regarding Iran, Secretary Hagel reiterated that President Obama is committed to preventing Iran from obtaining a nuclear weapon with all options on the table. He stated that the United States continues to believe there is still time to address this issue through diplomacy, but that window is closing. Secretary Hagel noted the two have had an outstanding working relationship dating back to Minister Barak’s days as prime minister and he thanked Minister Barak for his kind words at the American Israel Public Affairs Committee policy conference. 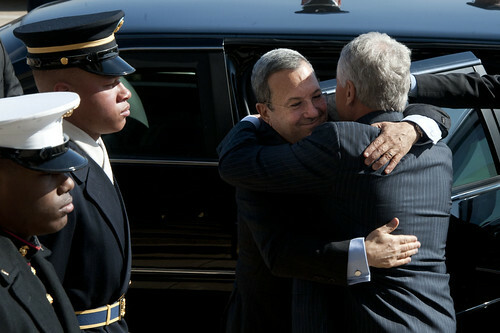 Secretary Hagel expressed his desire to visit Israel soon and Minister Barak stated that Israel looks forward to hosting him in the near future. President Barack Obama named Gerda Weissman Klein, President George H. W. Bush and thirteen others as recipients of the Presidential Medal of Freedom. The Medal of Freedom is the Nation’s highest civilian honor, presented to individuals who have made especially meritorious contributions to the security or national interests of the United States, to world peace, or to cultural or other significant public or private endeavors. The awards will be presented at a White House ceremony early next year. Gerda Weissmann Klein is a Jewish Holocaust survivor who has written several books about her experiences. After Nazi Germany took over her homeland of Poland, Klein was separated from both her parents: they were sent to Auschwitz and she to a series of labor and concentration camps. In 1945, she was sent on a forced 350-mile death march to avoid the advance of Allied forces. She was one of the minority who survived the forced journey. In May 1945, Klein was liberated by forces of the United States Army in Volary, Czechoslovakia, and later married Army Lieutenant Kurt Klein, who liberated her camp. A naturalized citizen, she recently founded Citizenship Counts, an organization that teaches students to cherish the value of their American citizenship. Klein has spoken to audiences of all ages and faith around the world about the value of freedom and has dedicated her life to promoting tolerance and understanding among all people. George Herbert Walker Bush was the 41st President of the United States. Prior to that, he was Vice President in the Reagan Administration, Director of Central Intelligence, Chief of the U.S. Liaison’s Office to the People’s Republic of China, U.S. Ambassador to the United Nations, and a Member of the House of Representatives from the 7th District of Texas. He served in the Navy during World War II. President Bush and President Clinton worked together to encourage aid for victims of Hurricane Katrina in 2005 and the Indian Ocean tsunami in 2004. Angela Merkel is the Chancellor of the Federal Republic of Germany. She is the first woman and first East German to serve as Chancellor of a unified Germany, which this year marks its 20th anniversary. She has often said that freedom is the happiest experience of her life. Chancellor Merkel was born in Hamburg but was raised in what was then Communist East Germany after her family moved to Templin. Her political career began when she joined the new Democratic Awakening party in 1989 after the fall of the Berlin Wall. In 1990, as West and East Germany merged into one reunited country, her party joined with the Christian Democratic Union, and she was elected to the German parliament. She has been chairman of the CDU since April 2000 and was recently reelected to another term. John Lewis is an American hero and a giant of the Civil Rights Movement. He served as chairman of the Student Nonviolent Coordinating Committee (SNCC), helped to organize the first lunch-counter sit-in in 1959 at the age of 19, and was the youngest speaker at the 1963 March on Washington. In May 1961, he participated in the initial Freedom Ride, during which he endured violent attacks in Rock Hill, South Carolina, and Montgomery, Alabama. In 1964, he helped to coordinate the Mississippi Freedom Project, and, in 1965, he led the Selma-to-Montgomery march to petition for voting rights where marchers were brutally confronted in an incident that became known as “Bloody Sunday.” Eight days later, President Johnson addressed a joint session of Congress, condemned the violence in Selma, and called for passage of the Voting Rights Act, which was enacted within months. Since 1987, John Lewis has continued his service to the nation as the U.S. Representative for Georgia’s 5th District, which encompasses all of Atlanta. Dr. Maya Angelou is a prominent and celebrated author, poet, educator, producer, actress, filmmaker, and civil rights activist, who is currently the Reynolds Professor of American Studies at Wake Forest University. She has served on two presidential committees, was awarded the Presidential Medal for the Arts in 2000 and the Lincoln Medal in 2008. Warren Buffett is an American investor, industrialist, and philanthropist. He is one of the most successful investors in the world. Often called the “legendary investor Warren Buffett,” he is the primary shareholder, Chairman and CEO of Berkshire Hathaway. Mr. Buffett has pledged that all of his shares in Berkshire Hathaway – about 99 percent of his net worth – will be given to philanthropic endeavors. He is a co-founder of The Giving Pledge, an organization that encourages wealthy Americans to devote at least 50 percent of their net worth to philanthropy. Dr. Tom Little was an optometrist who was brutally murdered on August 6, 2010, by the Taliban in the Kuran Wa Munjan district of Badakhshan, Afghanistan, along with nine other members of a team returning from a humanitarian mission to provide vision care in the remote Parun valley of Nuristan. Dr. Little and his wife, Libby, lived and worked in Afghanistan for three decades beginning in 1976, raising three daughters and providing vision, dental and mother/child care to the people of that country through the NOOR program (Noor means “light” in Persian) that Dr. Little ran for the International Assistance Mission. Yo-Yo Ma is considered the world’s greatest living cellist, recognized as a prodigy since the age of five whose celebrity transcends the world of classical music. Born in Paris, Ma was a child prodigy who went on to study with Leonard Rose in New York. He made his Carnegie Hall debut at age nine. He was the recipient of the Avery Fisher Prize in 1978, and, in 1991, Harvard awarded him an honorary doctorate in music. He serves as Artistic Director of the Silk Road Project, and has won sixteen Grammy awards. He is known especially for his interpretations of Bach and Beethoven, and for his ability to play many different styles of music, including tango and bluegrass. He serves on the President’s Committee on the Arts and Humanities. Sylvia Mendez is a civil rights activist of Mexican and Puerto Rican descent. As an eight-year-old, her parents attempted to enroll Mendez in an all-white school in their community, but were denied entry at and were told to go to the school for Mexican children. Her father and other parents sued and prevailed. The Mendez v. Westminster case was a landmark decision in the civil rights movement against segregation. Mendez currently travels around the country giving speeches on the value of a good education. Stan “The Man” Musial is a baseball legend and Hall of Fame first baseman for the St. Louis Cardinals. Musial played 22 seasons for the Cardinals from 1941 to 1963. A 24-time All-Star selection, Musial accumulated 3,630 hits and 475 home runs during his career, was named the National League’s Most Valuable Player three times, and was a member of three World Series championship teams. Musial also served as the Cardinals’ general manager in 1967, when the team once again won the World Series. Bill Russell is the former Boston Celtics’ Captain who almost single-handedly redefined the game of basketball. Russell led the Celtics to a virtually unparalleled string of eleven championships in thirteen years and was named the NBA’s Most Valuable Player five times. The first African American to coach in the NBA-indeed he was the first to coach a major sport at the professional level in the United States-Bill Russell is also an impassioned advocate of human rights. He marched with Dr. Martin Luther King, Jr., and has been a consistent advocate of equality. In 1974, Jean Kennedy Smith founded VSA, a non-profit organization affiliated with the John F. Kennedy Center that promotes the artistic talents of children, youth and adults with disabilities. From 1993 to 1998, Smith served as U. S. Ambassador to Ireland, and played a pivotal role in the peace process. Smith is the youngest daughter of Joseph and Rose Kennedy and is the Secretary of the Board of Trustees of the Kennedy Center. John J. Sweeney is the current President Emeritus of the AFL-CIO, and served as President of the AFL-CIO from 1995 to 2009. The son of Irish immigrants, a domestic worker and a bus driver in the Bronx, he worked his way up in the labor movement to become President of the Service Employees International Union, growing the union to serve as a strong voice for working people. As President of the AFL-CIO, he revitalized the American labor movement, emphasizing union organizing and social justice, and was a powerful advocate for America’s workers. American artist Jasper Johns has produced a distinguished body of work dealing with themes of perception and identity since the mid-1950s. Among his best known works are depictions of familiar objects and signs, including flags, targets and numbers. He has incorporated innovative approaches to materials and techniques, and his work has influenced pop, minimal, and conceptual art.